Most days are spent outside now. While there is always time needed for paperwork and correspondence, most of the daytime hours are spent outside. More chickens, all of the turkeys, weeds and planting occupy our time right now. Soon markets and processing will also be added to the days. 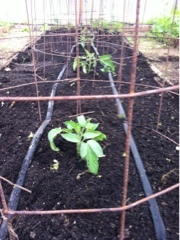 It is above freezing at night most nights now, so the first of the tomato plants were transplanted yesterday. Started inside the hoop house without electric heat or lights, we grow out everything from seed. We control the soil and water and most importantly the additives...for us, compost and compost tea. We have seen beautiful seedlings that, up close, smell like pharmaceuticals. We still get most of our seeds from Southern Exposure Seed Exchange, Landreth Seed, Territorial Seed, Seed Savers Exchange, Baker Creek, Hudson Valley Seed...the old varieties, not trademarked, lovely flavor and beautiful. Not perfect. Not massive. The tomatoes that went in yesterday were Black Brandywines. They were the earliest seeds we started, and it was because the pack was here before anything else was here...might have been a gift, or left over from last year. Started in December we did not think they would make it without supplemental heat, but here we are, growing them out. Planted in April! 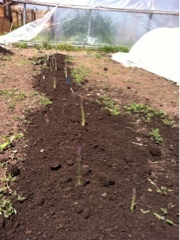 And the asparagus is coming on. We must start cutting to keep it growing.